Penny is a new Tripawd cat, but her people already have the Tripawd lifestyle down good. They built a ramp for their three-legged feline, to help her get on the bed. Penny’s people know that it pays to remember safety first, and now you can practice it too with these great ideas to make DIY ramps for cats and dogs. Life on three legs has some challenges. 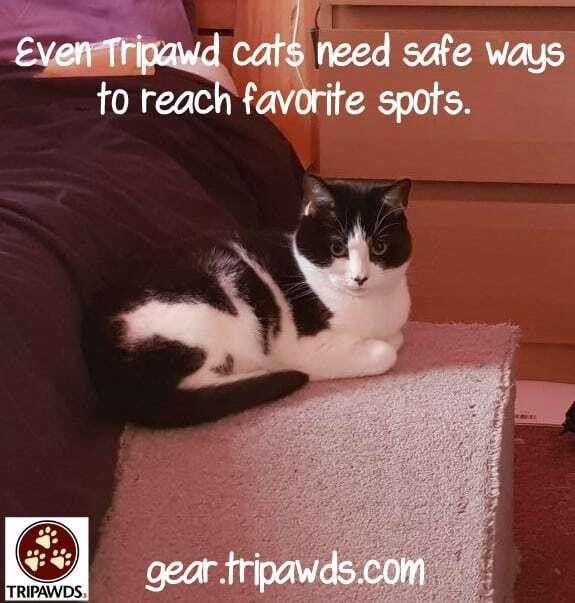 One of the biggest things new Tripawd parents need to figure out is how to help their dog or cat get up into the spots they love most, like furniture. With one less leg it’s in their best interest if they do not get up or go down the same way as before amputation. When an animal is missing a rear leg, jumping up is difficult since dogs and cats naturally use both rear legs for propulsion to move forward and up. With one less leg, that’s half the jet power they’re used to! And when an animal is missing a front leg, jumping down poses another serious risk: long-term joint damage to their front “wrist” or carpal joint. Either way, a Tripawd should have help going up and down from their favorite places. This Indoor Cat Ramp is So Easy to Make, Even a Teenager Can Do It! And for indoor/outdoor cats, this adorable video shows how to make an outdoor ramp for kitties living on the second floor. And here’s a sweet video about a ramp built just for this crafty man’s senior gal, Hannah. Don’t want to watch a video? Check out the blogger of My Repurposed Life. She has some wonderful tips on DIY Indoor Pet Ramps using reclaimed materials like cabinet doors. If you just don’t have the time to go the DIY route, these stairs for dogs and cats get great reviews on Amazon. And yep, these are affiliate links and the Tripawds Nation is partly supported by your Amazon purchases. Oh glad you found it helpful Jackie! Yes I especially love the video of the teenager making a ramp. It’s terrific to see kids thinking along these lines so as they grow up and get pets of their own, those pets will have all the advantages ours did not. Yay!